WHERE TO FIND PAGEANT DRESSES FOR YOUR LITTLE MISS? Do you dream of your little girl winning first place in a beauty pageant? Pageants are popular for both parents and children and are a great way to build self esteem and self confidence. Cash prizes and scholarships are another important plus for many participants. Here are a few tips for girls and their parents to prepare for the world of pageants. A big part of scoring in a pageant is stage presence. Starting early gets little girls used to being on stage and comfortable in crowds. Baby and toddler pageants are less pressured than so-called “Glitz” pageants. They cost less to enter and no performance is required. A cute dress and a big smile are sometimes all that are needed to win these contests. Enter local pageants as a trial run to larger regional and national pageants. Entry fees will be much cheaper and rules will be more relaxed. Most local pageants are “Natural” pageants meaning no makeup is allowed. Dresses are simpler and less expensive than for Glitz pageants. This relieves parents of expenses like tanning, bronzing, hair pieces, flippers and costly custom made dresses. 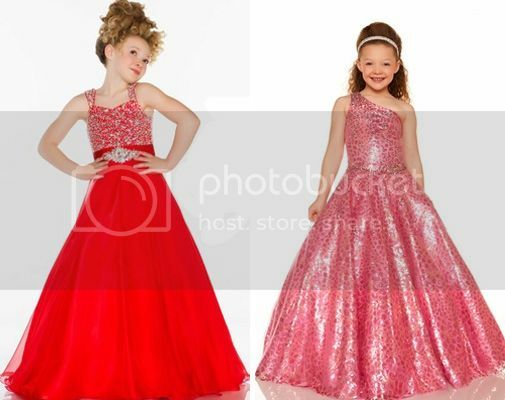 Shop girls pageant dresses at PageantDesigns.com to find a variety of readymade pageant dresses in a range of styles and prices for every budget. Pageants can be a positive experience for parents and children and can help to build self esteem and self confidence. Just be sure that both you and your child are undertaking pageants as a positive life experience.